If people ask me what I did this weekend it was this: I sat and sliced vegetables, very thinly. I am convinced that micro-slicing vegetables gives them entirely different characteristics. 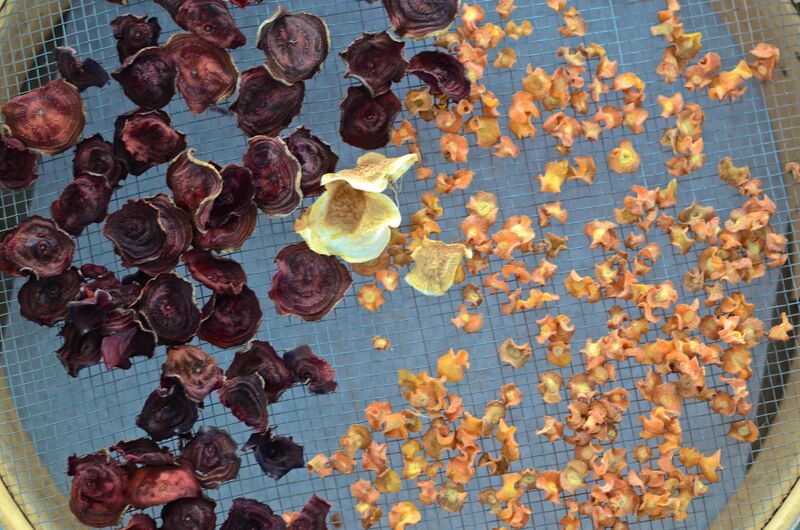 I love to then put them into salads or dehydrate them, like I did this time, to sprinkle on salads and other dishes. These feather-light bits melt on your tongue and give dishes the slightest crispy texture and rooty flavor. Shown here are carrots, beets, and a few turnips. I also listened to the audiobook All the Light We Cannot See by Anthony Doerr, mesmerizing and beautiful. The paperthin slicing and the deep listening were a restorative meditation after the holidays spent in very close quarters with loved ones, making all decisions in a block. It was wonderful, but this was nice, too. With some super-thin eggplant slices, I made up an eggplant lasagna. This has meat, but no pasta. You could easily add or subtract either one. Warm the oil in a large frying pan over medium heat. Add the onion and garlic and cook, stirring regularly, for 10 minutes or until they are translucent and pale golden. Stir in the tomato pesto and let it cook for a minute or so to release its flavor. Increase the heat a little and add the ground beef. Cook it for a couple of minutes until it changes color, breaking it up with a spoon. Mix in the tomato passata, red wine, and nutmeg. Season with salt and freshly ground black pepper. Adjust the heat so the sauce bubbles gently, and let it cook for about 10 minutes until it is thick but moist. Stir in the oregano, then leave the sauce to cool a little. Preheat the oven to 350 degrees and lightly butter a medium-large, deep ovenproof dish. Set aside. In a medium-size bowl, mix the ricotta, eggs, salt and pepper, and nutmeg. Set aside. 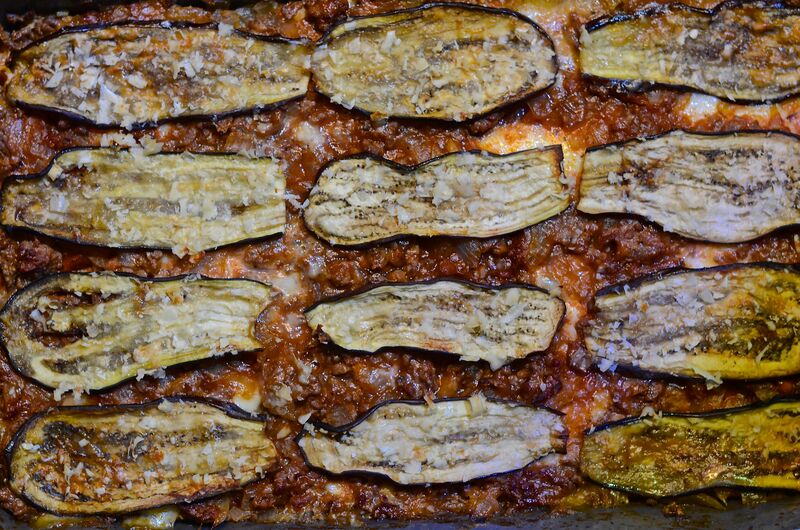 Cover the base of the baking dish with a thin layer of the meat sauce, then lay down a layer of eggplant (about 1/3 of it) with the slices slightly overlapping. Spoon half of the ricotta mixture over the eggplant and spread it as well as you can. Top this with half the mozzarella slices and sprinkle with half of the parmesan. Spread half of the meat sauce over the cheeses and spread evenly. Repeat the layering with half the remaining eggplant (save your most uniform slices for last), the rest of the ricotta mixture, the remaining mozzarella, and most of the parmesan, reserving about 2 tablespoons. Spoon the remaining meat sauce evenly over the top. Finish with an arrangement of the reserved eggplant slices, brushed lightly with olive oil. Sprinkle with the reserved parmesan. Bake for approximately 45-50 minutes or until the contents are bubbling and the top is browned. Allow to rest for at least 10 minutes, once removed from the oven, to settle and cool. *Beer brewers: A recycled grain bag left over from brewing makes an excellent strainer for making homemade ricotta, saving the cost of expensive cheese cloth.